Imaam As-Sadi [rahimahullaah] said: They [i.e. the upright scholars and teachers] are the mediators between the Messenger [sallal-laahu-alayhi-wasallam] and his Ummah with regards to propagation of his religion and clarification of his Sharee’ah. Had it not been for these ones, the people would have been like cattle. They are the ones who guide the Ummah in the fundamental and subsidiary affairs of their Religion. They return them to the rulings pertaining to the rights and dealings that are incumbent upon a person to fulfil, just as they return them to the affairs related to acts of worship. Through them, the Book and the Sunnah are established; truth is distinguished from falsehood, guidance is distinguished from misguidance, the lawful is distinguished from the unlawful, good is distinguished from evil, and [sound] rectification is distinguished from corruption. They are of varying ranks, in accordance with what they establish of knowledge, teaching and benefit- great or small. They have great rights [to be fulfilled] by the ummah and are possessors of a lofty status. Therefore, the people must have love and respect for them. They must recognise their excellence and virtue, and thank them greatly. They are to supplicate for them in private and public, and seek nearness to Allaah by having love for them and praising them. Therefore, his status is acknowledged because Allaah raised his status by way of the knowledge he is given. Rejecting the truth means: repelling, rebutting and denying it. And looking down on the people means: belittling them, humiliating them and being arrogant towards them. And when it is the case that this is [tantamount] to pride [when dealing with the] people, then how about this [behaviour of yours towards] the scholars. One should contemplate on their statements and their Ijtihaad [i.e. those verdicts they give after striving- to the best of their knowledge-to reach the truth]. One should not rush to refute it [i.e. their statements and verdicts], for how many statements of a scholar is criticised by some people, whilst the evil of the criticiser [i.e. the evil he causes for himself and others] was due to an unsound understanding of the statements of the scholar or [scholars]. One does not seek to diminish their status by saying that they do not possess knowledge of a worldly craft. So, it should not be said about a scholar [i.e. whilst seeking to diminish his status], “He does not possess knowledge of medicine or engineering.’’ And likewise, some people seek to discredit the scholars by saying that they are lacking in their knowledge of current affairs, even though the Miskeen – [i.e. this one who seek to discredit the scholars through this false claim is one greatly lacking in understanding, wisdom, insight, experience]- does know which ‘Knowledge of current affairs’ is to be given consideration [or importance]! He does not know that there is- in the Islamic legislation- that which suffices the one who wants true knowledge and comprehension. Therefore, it is obligated on a Muslim to restrain his tongue from [uttering] that which is impermissible [or unbefitting], and he should not speak except based on clear-sightedness. One requires knowledge to say that such and such person does not possess understanding of the ‘knowledge of current affairs’. Therefore, none should say this except one who possesses knowledge to enable him to make a judgement that such and such person does not possess knowledge of current affairs. As for saying so haphazardly [or randomly] and making a judgement based on one’s view without proof, then that is great evil and it is not permissible. It requires proof to say that a (particular) Saahib Al-Fatwaa – i.e. a scholar who is qualified to give Fatwaa – does not understand knowledge of current affairs, and none is able to do so except the scholars. One should keep close companionship with them, gather around them, acquire knowledge from them, keep away from splitting and blameworthy differing. And one must know that the danger of being distanced from the scholars is great indeed, for indeed a wolf preys on the lonely sheep. [On the other hand], by gathering and uniting around the scholars, and keeping close companionship with them, one is safeguarded from falling into bidah – the traps of desires and lust. And in this also [i.e. keeping close companionship with the scholars] is exaltation of the religion, knowledge and the scholars, and it strikes fear in the hearts of the disobedient people and wicked sinners. This is a moral conduct [commanded by Allaah] to His slaves – that they do not do this [i.e. hasten to spread news]. And it is obligated on them that when there comes to them an affair from the important affairs – matters related to a universal benefit for the people, public safety and those affairs on which depends the sorrow or happiness of the believers, or an affair of public fear which may bring about calamity upon them- that they should verify the [news of that affair] and not to be hasty in spreading it; rather they should refer it back to the Messenger [sallal-laahu-alayhi-wasallam] and to those in authority- the people of sound opinions, the people of knowledge; those who can give sound advice, the people of intelligence and those who approach affairs with calmness, and they are those who know what is of overriding benefit and that which is in opposition to it [i.e. the scholars]. So, if they see that disseminating such news will bring about an overriding benefit for the Muslims, strengthen them, bring about happiness and make them vigilant over their enemies, then they would disseminate such news; but if they see that there is no overriding benefit in disseminating such news, or that there is benefit in it, but there is more harm in doing so; then they would not circulate such news. [ وَلَوْ رَدُّوهُ إِلَى الرَّسُولِ وَإِلَىٰ أُولِي الْأَمْرِ مِنْهُمْ لَعَلِمَهُ الَّذِينَ يَسْتَنبِطُونَهُ مِنْهُمْ – If only they had referred it to the Messenger or to those charged with authority among them, the proper investigators would have understood it from them (directly)]– Meaning: They would have derived from it [the proper cause of action] through contemplation and through their correct opinions and rightly guided sciences. Therefore, in this there is proof regarding a principle related to a moral conduct, that when an [important affair] from the [important affairs] suddenly appears, it is obligatory to refer it to those who are competent in the affair and one should not put himself forward before them, for that is closer to correctness and [safer] in preventing mistakes. And in this, there is a prohibition against being hasty in circulating news [that is related important affairs of public safety or fear] and a command to contemplate before speaking- to look into the affair, as to whether it is an affair of overriding benefit to be dealt with, or whether it should be avoided if it does not carry an [overriding benefit]. [وَلَوۡلَا فَضۡلُ ٱللَّهِ عَلَيۡڪُمۡ وَرَحۡمَتُهُ – Had it not been for the Grace and Mercy of Allah upon you]- Meaning: [Had Allaah not] granted you the ability to act upon righteousness, instructed you with moral conducts and taught you that which you never knew, then [لَٱتَّبَعۡتُمُ ٱلشَّيۡطَـٰنَ إِلَّا قَلِيلاً۬ – you would have followed Shaitan (Satan), save a few of you]. One should not be a partisan of their statements without proof. There is a difference between exalting the scholars, honouring them and acknowledging their rights as opposed to being a partisan of their statements when they oppose the proofs. Indeed, [blind] partisanship is blameworthy and it is [attributed] to ignorance [ref 1]; but showing respect to a scholar and honouring him is among the virtues of knowledge. And abandoning those statements of the scholars that are in opposition to the proofs is not tantamount to nullifying their statements and a violation of their rights, rather it is adherence to the path of the infallible one [i.e. 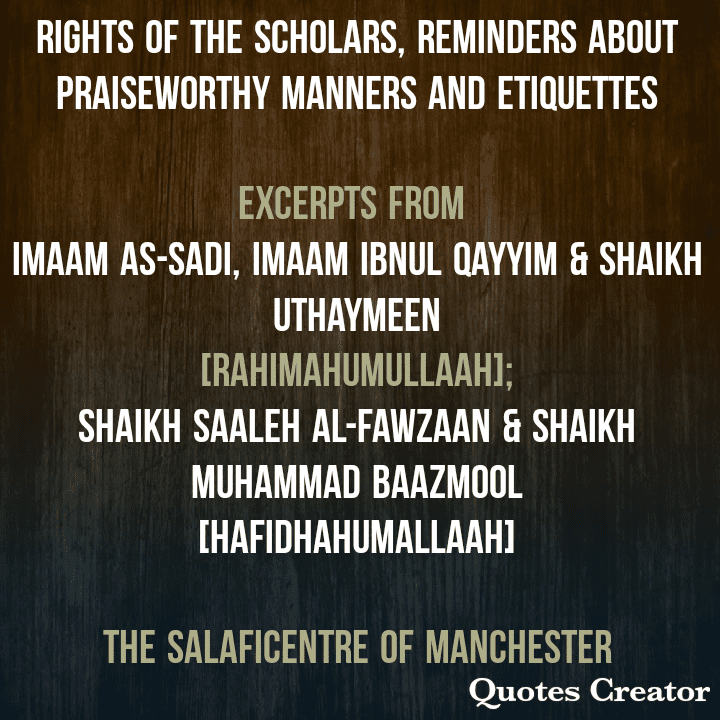 the Prophet (sallal-laahu-alayhi-wasallam)] and a protection of the rights of the scholars. The statement of Umar bin Abdul Azeez: “For indeed knowledge does not vanish except when it becomes concealed” -Meaning: Hidden. knowledge will become something concealed. This [concealment of knowledge] will inevitably occur when the rights of the scholars are violated, because if the rights of a scholar are violated, the people will keep away from his knowledge and thus it becomes hidden. Knowledge is no longer known except as something hidden [to some people] due to the [majority of the people] being overwhelmed by ignorance. Therefore, the people must know the scholar and the scholar must teach the people, and the people must benefit from his knowledge. [And knowledge must be spread so that the one who does not know comes to know, for indeed knowledge does not vanish until it becomes concealed]. If it is said, “How is death of the scholars – in reality -connected to the disappearance of Knowledge when it is the case that the Magnificent Qur’aan and the Sunnah are present, and the Books of knowledge are present, compiled and categorised?! The answer to this is: A scholar exalts the religion and the Islamic law, so he urges the people and calls them to act upon the obligatory and recommended deeds. There are many Sunan that are compiled and written down, but were manifested through a scholar, who called the people to it, taught them [about it] and urged them to revive it, and this cannot be accomplished merely due to the presence of books. An [upright] scholar-amongst the people- is a righteous example to follow. People see the practical implementation of the religion from him, and being a [righteous] example is one of the greatest means through which people are nurtured and taught. The Sunnah is an [uptight] scholar’s distinguishing characteristic, so when a scholar dies, the image of the religion – which he carried amongst the people – departs, and this [i.e. practical example and manifestation of the Sunnah] cannot be accomplished merely through books. The scholar possesses knowledge and precise understanding to aid him derive [sound] ruling [from the texts of the Sharee’ah]. So, when a Naazilah [i.e. an affair related to public safety or fear] occurs, he is able to quickly derive a ruling, teach the people, disseminate the ruling and explain the Sharee’ah ruling related to that [particular] Naazilah. The ability [to do this] is not acquired by merely reading books when a Naazilah occurs, without the oral skills, knowledge and prolonged experience possessed by the scholars. An [upright] scholar has precise understanding of the Qur’aan, the Sunnah and the various sciences related to the religion. He has knowledge and wisdom related to nurturing and teaching others, and he has experience. He has [good] awareness of the different circumstances of the people, their daily pursuits and general affairs, which is not found in books. And if a person wanted to acquaint himself with all these affairs, he would need a long time [or many years] to do so; but the scholar came across these affairs during his lifetime- from the very beginning of his path in pursuit of knowledge; so how can all of this be merely acquired by [reading] books?! Violating the rights of the [upright] scholars will make the common people unaware of the station of Ahlul Ilm [i.e. the people who possess correct understanding of the religion], nor will they preserve their status, so the clear authority to consult in their lives becomes non-existent and thus they wander about in the darkness of ignorance, and social order is destabilised; for indeed the scholars are the ones who guide [and rectify] the people, the land and the kings. Therefore, the passing away of the scholars- in reality- leads to corruption of the [upright] world order – the people will not have an [upright] authority to refer to during Nawaazil [i.e. events related to public safety and fear] and thus they fall into great confusion and disorder, except that which Allaah wills not to happen [or except those whom Allaah wills that they will not be affected by this confusion and disorder]. This is what has been reported in a Hadeeth by Abu Hurairah [radiyallaahu-anhu] who said that the Prophet [sallal-laahu-alayhi-wasallam] said, ‘’ The hour [Last Day] will not be established until [uncorrupted religious] knowledge will be taken away by the [death of upright scholars], earthquakes will be very frequent, time will pass quickly, Al-Fitan [trials and afflictions] will appear, murders will increase, and money will overflow amongst you.’’ [Saheeh Al-Bukhaari Number 1036] So, look at how these signs have occurred one after the other? Taking ignorant ones as leaders occurs as result of the absence of an [upright] authority to consult. A person needs someone to ask and consult, but if he cannot find [upright] scholars because their characteristics are unclear to him and he does not consider them to be scholars, he will look for someone else who portrays himself as a scholar and consult him. [Also] when the rights of the [upright] scholars are violated, the people will agree with ahlul bidah wal ahawaa [the people of religious innovation and evil desires] and imitate them, because among the ways of ahlul bidah wal ahwaa is that they belittle the [upright] scholars. Examine any sect or group – those who contradict that which was revealed to the Messenger [sallal-laahu-alayhi-wasallam] and the path that was followed by the Sahaabah- and you’ll see this behaviour from them [i.e. they belittle the upright scholars]. The affair of the Shee’ah is well-known; the state of the affairs of the khawaarij in relation to this behaviour [i.e. belittling upright scholars] is something that has been mentioned [and is well remembered], and the affair of the Mutazilah [in relation to this affair] is well-known. As for the Soofiyyah, their turning away from the [upright] scholars is evident. You will not find a sect, group or party that opposes the straight path and exits the path of the Sahaabah, except that they speak against the [upright] scholars, seek to diminish their worth, violate their rights and follow ignorant leaders. There is no path towards a return to the [upright] religion except through the [upright] scholars; so, if the rights of the [upright] scholars are violated, the people will not recognise them. They will keep away from the [upright scholars] and take ignorant ones as leaders, then how can they be returned to the [upright] religion. If the upright scholars are dropped [or removed from their rightful status] and the people take ignorant ones as their leaders, then who will return the people to their [upright] religion?! How will they be removed from that state of humiliation and disgrace without the [presence and guidance] of the [upright] scholars?! -One should be eager for the lesson and carry on learning [listening, being attentive etc]. -One should [strive] to understand the scholar’s expressions and indications. -One should face the scholar [during the lesson]. -One should not busy himself with anything – whilst he is in the scholar’s presence- other than listening to him. -One should not move too much, except when required. -One should abandon saying in too many words what may be said in few words during the lesson, even if he is given permission to make a comment. -One should abandon asking questions during the lesson and should only do so after the lesson. -If one hears the answer of a scholar [to a question], he should ponder upon it and strive to understand before asking a second time. -The student should not raise his voice in the presence of his Shaikh. -The student should hasten to carry out the request of his Shaikh. -The student should not put himself forward before his Shaikh, but should be at his service. -The student should address his Shaikh honourably. -The student should not insist [that his Shaikh does something for him] when the Shaikh is either tired or pre-occupied. -The student should not persist in asking something which he knows the scholar does not want to talk about. -One should be under the authority of the scholar, whilst sitting in the gathering. -One should make room for other students who want to sit. -One should not desire to speak, neither should he argue nor debate. -One should not start speaking until the scholar begins [and gives him permission]. -One should not impose what is to be spoken about in the sitting without the permission of the Shaikh. -One should not speak after the Shaikh has spoken, unless given permission by the Shaikh. -One should not make the Shaikh perceive that he is tired [bore] or displeased. -One should not sit whilst not [desiring] an increase [in knowledge] or whilst having little concern for the sitting. -One should exercise patience when he experiences something defective from the Shaikh’s character or experiences harshness from him, because the Shaikh is [nothing else] but a human being [i.e. he is not perfect]. Shaikh Uthaymeen [rahimahullaah] was asked about those people [may Allaah guide them] who say, “I have heard some of the scholars saying such and such, or given a Fatwa”; then he [i.e. the one who attributes such a statement to a scholar or scholars] uses this as a basis for his statement or action. Imaam Ibnul Qayyim [rahimahullaah] stated above that one should beware of kadhib (lying), for indeed it corrupts one’s ability to illustrate information based on what it should be in reality. It corrupts one’s ability to illustrate information and his ability to teach the people. Firstly lies emerges from the heart and then on the tongue, so it corrupts it; then it transfers to the limbs and corrupts its actions, just as it corrupts the statements of the tongue. Therefore, lying prevails over his statements, deeds and state of affairs; corruption becomes deeply rooted in him and its disease leads to destruction if Allaah does not grant him cure him with the medication of truthfulness, which uproots its (i.e. lying) from its original source. This is why the basis (or foundation) of all the deeds of the hearts is based on truthfulness; and the basis of their opposites – such as showing off, self-amazement, pride, being glad (with ungratefulness to Allaah’s Favours), conceitedness, boastfulness, insolence, weakness, laziness, cowardice, disgrace and other than them- is lies. The origin of every righteous deed- whether carried out in private or public- is based on truthfulness. And the origin of every corrupt deed – whether carried out in private or public- is lies. Allaah punishes the liar by preventing him from those affairs that will bring him well-being and benefit, and He rewards the truthful one by granting him the ability to attain the beneficial affairs related to the worldly life and afterlife. There is nothing similar to truthfulness with regards to the manner in which it bring about the affairs of wellbeing in this life and the next, and there is nothing similar to lying with regards to the manner in which it corrupts and harms one’s worldly affairs and the afterlife. 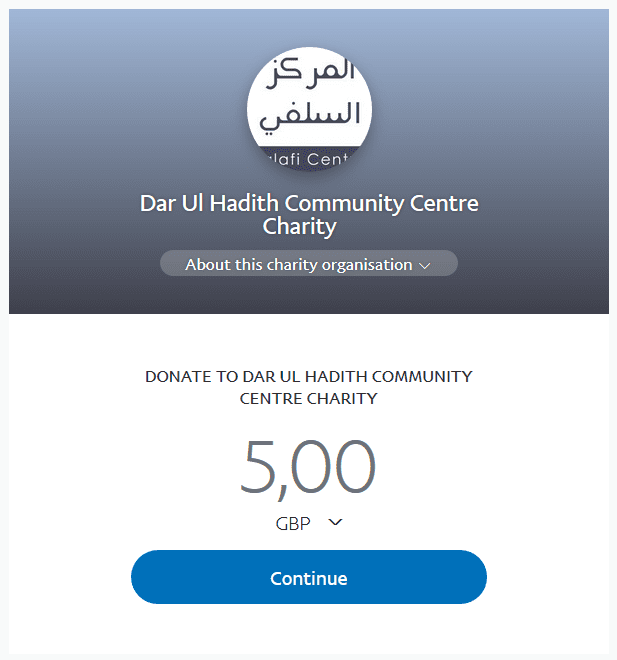 Is Lying Permissible In Dawah? Question to Sheikh Saaleh Al-Fawzaan (hafidha-hullaah): Is lying permissible in calling to Allaah? And is ‘the goal justifies the means’ a maslahah (benefit) from the masaalih (beneficial affairs) of the Sharee’ah? Answer: Lying is not permissible. It is a major sin from the major sins. It (lying) is not permissible except in three affairs which the prophet made an exception; lying during war, because war is deceit; lying in order to bring about peace between the people; and lying between married couples in order to bring about rectification to the family with regards to the relationship between (husband and the wife). These three affairs are that of maslahah, and in them is a greater good than evil; so (lying) is permissible (in this case).